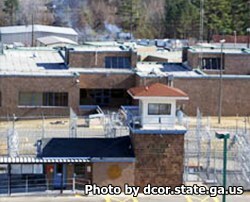 Central State Prison is located in Macon Georgia, part of Bibb county. It is a medium security institution that can house 1153 adult male inmates. Inmates are held in either two man cells or in an open dormitory setting. In addition, inmates who are difficult to manage, or who have safety and security concerns are placed in segregation, which isolates the inmate from the general population. Offenders incarcerated here can receive counseling for substance abuse, family violence, and a variety of individual therapies. Inmates can learn a useful new skill in the vocational programs, including plumbing, building maintenance, carpentry, and garment manufacturing for the correctional industry. Visiting hours are 9am-3pm on Saturdays, Sundays and State recognized Holidays.